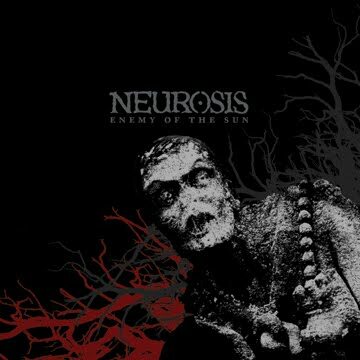 Neurot Recordings is proud to announce the reissue of one of the most groundbreaking releases in the ever-expanding lineage of icons NEUROSIS, Enemy Of The Sun. With NEUROSIS' earlier releases -- 1987's Pain Of Mind, and even 1990's The Word As Law -- the band's jagged and eerie blend of metallic, hypnotic, post-gutter punk was instantly recognized as wholly unique, yet it took multiple releases for the then Bay-area unit to infinitely define their sound, forcing the world to listen, then run for cover. Their 1992 full-length Souls At Zero showcased the band branching off into much more expanded songwriting, giving birth to much longer hymns, infusing them with tribal rhythms and slow-building post-doom bastardization, then breaking massive new ground for the metal world. But it was their follow-up in 1993, the crushing Enemy Of The Sun LP, that would be the album to take the pulsing, hypnotizing monoliths NEUROSIS was crafting down to much darker, and much, much heavier territory for the rest of the band's still-growing roster of masterpieces. Still to this day, critics and fans of heavy and experimental metal hold this release to be one of the harshest, spine-chilling, mind-warping releases in history, and countless acts have cited Enemy... as "the one that changed everything" for them. The eight tracks on the release was one of the most massively cavernous, crushing records the world had experienced. A mesmerizing, pressurizing, dirge-driven display of brutal riffing, thick with haunting samples, layered, anguished vocal tracks, raging multiple-member percussion contributions, and some of the most mammoth buildups ever, Enemy Of The Sun was an album that left a sense of anguish in your soul long after the record was over. Neurot Recordings are exceptionally proud to celebrate the 25th anniversary of NEUROSIS, and once again issue this classic album to the masses. 2010's reissue of Enemy Of The Sun bears a fully redesigned package by visionary artist, Neurosis live visual master Josh Graham, and will be released worldwide on August 30th, 2010.